The OPPO F1s, the most awarded device in our 2016 TeknoGadyet Readers' Choice Award (Smartphone of the Year, Best Smartphone Under 15K and the Best Selfie Smartphone) got even better, now with a bigger RAM and twice the built-in storage. Yes, that is right, the OPPO F1s gets an upgrade, it now has 4GB of RAM, up by 1GB from the 3GB of the original variant. With the added volatile memory, users can now experience more seamless and snappier performance. Moreover, the internal storage is now 64GB or double the amount of the ROM, which is 32GB of the first edition. With the larger space plus the ability to expand more via micro SD card, you got yourself a digital photo album on the fly. Other than the upgrade mentioned above, the rest of the specs remain the same, see below for full details. 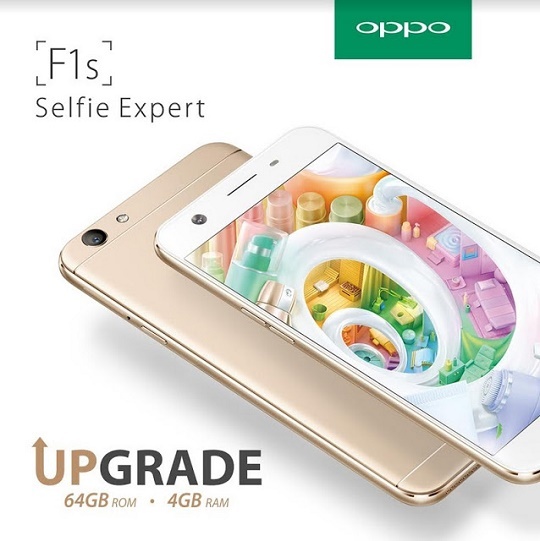 It is now available in all OPPO stores, kiosks and authorized retailers nationwide for a retail price tag of Php13,990.